Small bathrooms, or half-baths, present unique design challenges. You want functional storage without cramping an already tight space or a trendy design without being visually overwhelming. Whether your goal is to make your small bathroom more functional for everyday use, or just more aesthetically appealing, you have several options. With less square footage to cover, you can opt for those pricier materials. Go for a more expensive tile and give your bathroom a luxurious feel without breaking a budget. If you’re feeling adventurous, take advantage of the lower cost and hop on the one material trend, making its comeback this year. You can also install high-quality countertops since material costs will be low. Quartz is a durable and trendy material that typically costs $70-$100 per square foot. A typical vanity size in a small bathroom is 3.5 square feet, meaning you could install a quartz countertop for about $300. Even small bathrooms are full of stuff. Makeup, lotions, toothbrushes, cotton balls, curling irons—the list goes on. Where can you put all your daily items that is accessible without adding to the clutter? Floating shelves give you storage room, while taking up less visual space than cabinets. To make the space look better, put items in matching jars or containers. This will make the space look cleaner and keep items within reach. Floating vanities are a big trend in 2018. Lifting the vanity from the floor gives visual space without sacrificing cabinet storage. Corner/over-the-toilet shelving units make use of under-utilized space. Using baskets and jars to store your items vertically will keep your bathroom spacious and functional. Before deciding on a design for your bathroom, consider its use. Is it the main bathroom that you use every day, a guest bathroom, a powder room? Understanding its main function will help you decide on a bathroom design that works best for your needs. Dark vs. Light: A small room should use light or neutral colors to visually maximize space. While this often holds true, if your bathroom has a natural light source, you can opt for something more dramatic. Pocket doors maximize floor space by sliding directly into the wall. This will leave you more space for much-needed storage units. If pocket doors aren’t in your budget, consider trendy interior barn doors, which are often more affordable than pocket doors while still upping resale value. Glass shower doors can make your bathroom seem larger, because you can see the entire square footage of the room. Shower curtains create a visual wall, cutting down your already small space. If privacy is a concern, consider frosted glass as an alternative. Bright lighting is not only useful in a bathroom, it will make the space seem larger. Multiple light sources will help eliminate dramatic shadows, making your space seem more open and airy. Whether you go the DIY route or decide to hire a professional depends on the scale of your remodel. The average, national cost to remodel a small bathroom, according to a HomeAdvisor survey, is $6,500. A large-scale remodel involving plumbing or electrical work would require a pro and will cost more of your budget. However, if you’re remodeling a powder room, the basic DIY cost falls to under $700. A mid-scale remodel of a guest and master bath costs an average of $150 per square foot and $250 per square foot, respectively. 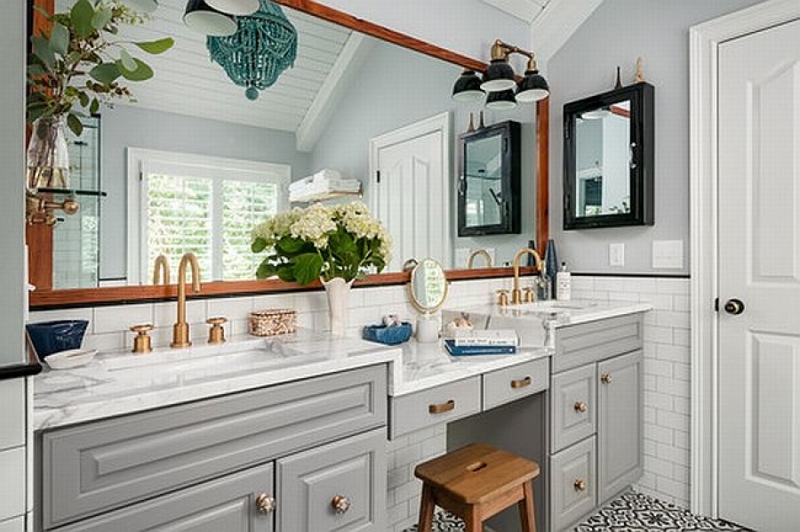 A small bathroom is the perfect place for creativity and playing with contemporary trends. Think about the room’s function, create storage and space solutions, and have fun designing your space!